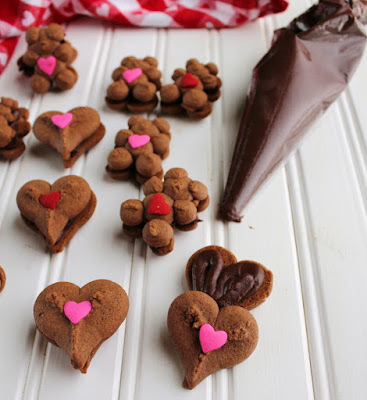 Cute chocolate cookies are just minutes away with fun spritz cookies. Sandwich some ganache frosting between them for an extra delightful dessert treat! Make simple chocolate spritz cookies extraordinary by sandwiching a layer of rich ganache style frosting between them. 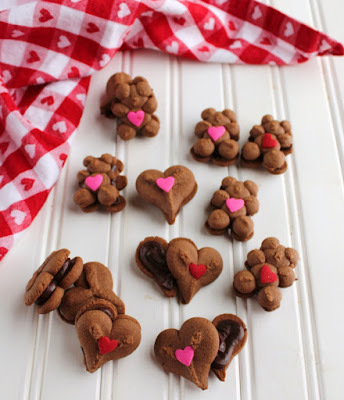 These hearts and teddy bears are dressed up for Valentine's Day but you could change the design to match any holiday or feeling. It is that time of year again, Valentine's Day is right around the corner and chocolate treats are on my mind. Not that they aren't all year long, but Valentine's Day seems to be an extra chocolaty holiday. It can't be just me that thinks that, can it? Surely not! 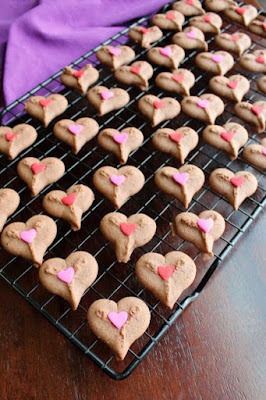 While Valentine's Day is certainly a great excuse for chocolate cookies, it is not even the main reason this time. These are cookies for a cause as well! In what is quickly becoming one of my favorite events each year, these cookies are helping spread awareness of a cause that is near and dear to my heart: childhood cancer research. If you are a regular visitor here (thank you!) you have probably seen me talk about Cookies for Kids Cancer before. They fund great research for pediatric cancer cures through a variety of ways. You can order cookies from them, for one. Or you can host a bake sale or other fundraiser in their name. The proceeds can be directed towards a particular avenue of research if one speaks to you more directly, otherwise you can let their panel of professionals decide which research projects would benefit most from the funds. This is my second year participating in a fundraising effort spearheaded by The Little Kitchen. Every dollar of my donation was matched by three generous sponsors. That's right, my $50 donation became $200 when Dixie Crystals, OXO and MediaVine matched them. You can donate and get the same growing power! Just click HERE and donate what you can. I have learned a lot about pediatric cancer and what an ugly disease it is in the last few years. The treatments meant to cure the disease ravage the small little bodies receiving them. The risk of permanent side effects is huge and the chance of recurrence or secondary cancers is alarmingly high. We have to do better for our littlest warriors. Right now a very small portion of the national cancer research budget goes towards research specifically for pediatric cancer, four percent to be exact. It's why you might have seen the #morethanfour hashtag during September, which is pediatric cancer month. I have shared a little bit about why the cause is so extra important to me in past posts. To learn more and get great cookie recipe you can check out these: Salted Chocolate Chip Cookies, Chewy Maple Cinnamon Cookies, and Soft and Sweet Sugar Cookie Bars. Now back to the cookies! 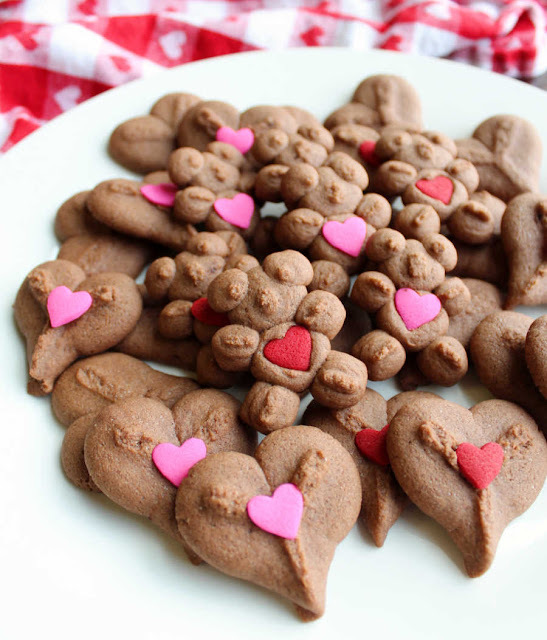 These teddy bears and hearts are a perfect treat for all of your Valentines. The cookie dough comes together quickly and you just crank out the designs with a cookie press. There is no need to chill the dough, in fact you don't want to! And there is no rolling or cutting, just load the chamber and click your way to a tray full of cookie dough. We added large heart sprinkles to make these gems extra festive, but they are cute without as well. You could stop there and have perfectly delicious cookies. But if you know me, you know I don't pass up a chance to frost something. In this case a rich fudgy frosting between two cookies seemed like a perfect way to go from good to great. I melted together some dark chocolate chips, butter and cream to make a rich and not too sweet filling. You could definitely use milk chocolate if you prefer a milder affect. My husband thought this combination was perfect. The slightly soft cookies give way to a rich layer of not too sweet fudge. Make yourself a batch and you'll see exactly what I mean! Use room temperature dough, don't chill it! If you want to get rid of the ridges on the top of the cookies, gently press them down with your finger before you bake them. The cookies freeze well, so you can bake them ahead of a party. They are also good drizzled with a simple glaze and sprinkled with sprinkles. Bonus: The fudge frosting would be perfect spread over cookie bars or a 9x13 cake. Double the frosting recipe and it'll be perfect for frosting a layer cake. Help us make a difference by donating to Cookies for Kids' Cancer! Our goal is to raise at least $3000. Because these three companies: Dixie Crystals, Mediavine and OXO have each pledged to match our donations raised through this campaign up to $3000! 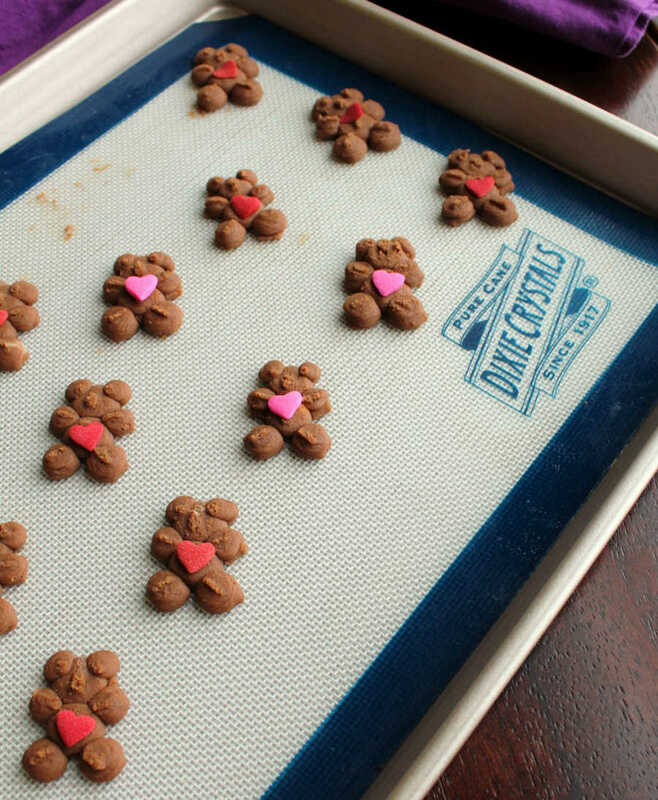 Cute chocolate cookies are just minutes away with these fun spritz cookies. Sandwich some ganache frosting between them for an extra delightful dessert treat! In your mixer, cream together the butter and sugar until it's light and fluffy. Add the egg and mix until combined. Mix in the water and extract(s). 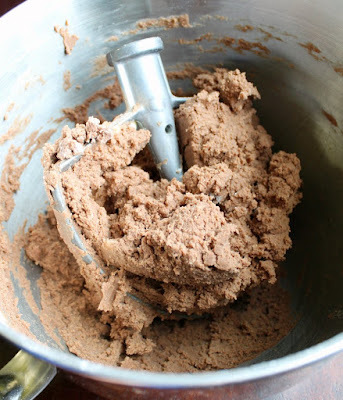 In a bowl, whisk together the four, cocoa powder, baking powder and salt. Mix the dry ingredients into the wet ingredients until it is just combined. Spoon into a cookie press, follow the instruction of the press to push out onto a baking sheet. I like to bake them on a silicone baking mat or parchment paper to prevent overbrowning of the bottoms. Press in a heart sprinkle if desired. Bake at 375F for 7-8 minutes. Cool for 5 minutes on the pan and then remove to a wire rack to cool completely. Put the sugar, cream and butter in a medium sauce pan. Heat over low until the butter is melted and the mixture is hot. 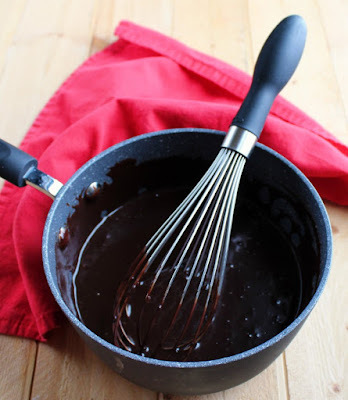 Remove from heat and stir in the chocolate and extracts. Keep stirring until it is smooth. Once the chocolate is melted and the mixture is smooth, set aside to cool. 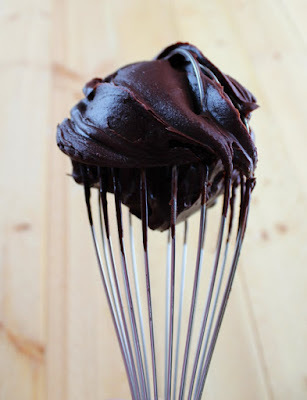 Once the chocolate mixture is close to room temperature, it should be a frosting consistency. I find it easiest to pipe it onto the cookies, so spoon it into a piping bag or plastic baggie. Cut the corner off the bag and pipe onto half of the completely cooled cookies. Top with the remaining cookies. Store in an airtight container until ready to serve. So cute! I just love the hearts on the bears! Thank you! We were really happy with how they turned out! I love this fundraiser. Bears and Hearts.....oh my cuteness and especially little dude spritzing them out! These are adorable, Carlee! I never think to make spritz after Christmas but I don't know why--they're delicious year-round! They really are good year-round and they have so many fun shapes you can do. We have a whole collection of fall/Halloween discs so I really need to remember to make some in the fall too! Those are SO cute, Carlee. I can't wait to try them. Thanks for sharing. I, too, love this event and the cause it supports. Thank you, Camilla! This is my second year participating and I have been looking forward to it. It is such a fabulous cause and a fun way to support it! Such a cute and festive cookie and I love that you made these in honor of Cookies for Kids Cancer! 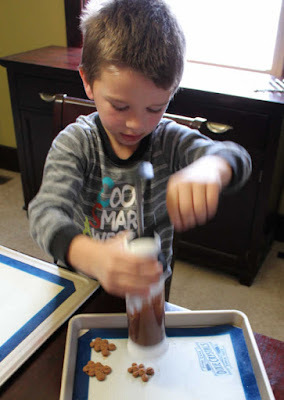 Thanks for sharing the recipe on the Celebrate 365 Blog Party! They are almost too pretty to eat but I think I can force myself. I like that you are supporting Kids Cancer. Thanks for sharing with us at Merry Monday. We love good recipes! Good cookies and a great cause, it doesn't get much better! Thank you! These cookies are absolutely adorable! I love everything about them. Thank you, they are cute and delicious... the perfect combination! Your Chocolate recipe looks delicious. I love chocolate and I'll be featuring your post tonight at Merry Monday! See you at the party! 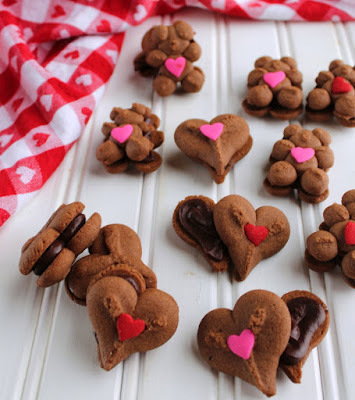 Your cookies are just perfect for Valentine Day! Hope you have a great Valentine Week and thanks so much for sharing with us at Full Plate Thursday! What a perfect cookie for the cause! And that ganache?! Oh my! I will be trying it for sure! From the bottom of my heart, thank you for participating in our V-Day event and driving awareness to C4KC's mission! Thank you for putting it together, I love getting to bake for a great cause!